What is included with my purchase of the AppWeigh scale sensor? You will receive the AppWeigh Bluetooth enabled scale sensor and fittings to connect the sensor to your air suspension. This sensor will then broadcast your weight information to the AppWeigh app where you will view the weight on any Bluetooth enabled smart device (phone, tablet). Do I need to purchase an installation kit as well? No. We do not try to up-sell you anything extra, as we’ve already included everything required for a standard install with the AppWeigh sensor. For increased range, it may be beneficial to acquire additional airline to run to the side or front of the equipment, and mount the sensor(s) closest to where the user will be. How much does the AppWeigh app cost to download? The App Weigh app is FREE to download and use, and works in coordination with the AppWeigh Bluetooth enabled scale sensor(s). It is available for download on both the Apple App Store and Google Play store. Will the AppWeigh app work on any phone or tablet? The app will work on any smartphone or tablet (Apple iOS, Droid, etc.) that is Bluetooth capable. What hardware do I install on my truck or trailer to view the weight on my smartphone or tablet? You only need to install the AppWeigh scale sensor(s). 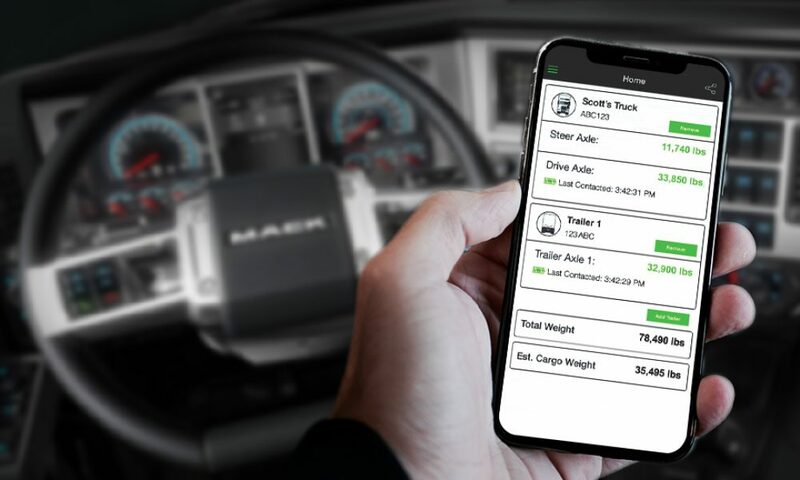 Our free app then receives the weight information from the sensor you connect to your air suspension of the axle group being monitored. How do I install the AppWeigh scale sensor? The App Weigh scale sensor quickly installs by connecting the included fitting into the airline of your air suspension being monitored. Because it is powered by its own internal battery, it requires no electrical wiring. In fact, it is such a simple installation that many of our customers are able to install it themselves in a matter of minutes. How many AppWeigh scale sensors do I need to install? One sensor is required for each leveling valve of each axle group being monitored. Most axle groups will typically have only one leveling valve, so most tractor/trailer combos will require two sensors (one for the drive axles of the truck, and one for the axles on the trailer). Confirm for your specific equipment. What is the range of the AppWeigh Bluetooth enabled scale sensor? Direct line of sight can be 100ft+. However, several factors can affect the range, including the individual receiving phone or tablet being used, as well as any physical obstructions between the scale sensor and the smart phone/tablet in use. To increase range, install the scale sensor out-from-under the truck/trailer where it can be seen by the user (mounting the sensor closest to where the user will be). What is the accuracy of the AppWeigh scale? Is there a scale to mount on my equipment? No – you will only need to install the AppWeigh sensor. The “scale” that displays your truck and/or trailer weight information is part of the application (app) you download to your smartphone/tablet. The weight of your truck and/or trailer is then viewed on your phone/tablet, showing each axle group being monitored as well as gross weight. How long does the scale sensor battery last? The battery life of the scale sensor depends partly on how frequently the equipment that the sensor is installed on is in use. Assuming that the truck/trailer is in constant use, the expected battery life is 1-2 years. YES. The battery is easy to replace by unscrewing the cap on the sensor casing. Batteries are inexpensive, and available to buy online. How do you calibrate the scale for accuracy? The scale is calibrated by simply entering the axle group weights into the app both when empty, and again when fully loaded. It is best to obtain your weights from a certified scale to ensure accurate calibration (from a CAT Scale, for example). How often do I need to re-calibrate? The calibration process is intended to be a one time process. However, it is advised that you confirm the accuracy of the AppWeigh scale against a certified in-ground scale once or twice per year, or following any major maintenance or addition to your equipment, and re-calibrate if needed. Are the calibration settings saved if I use a different phone/tablet, use multiple smart devices, or replace my smart device? YES! All weight data is saved on the “cloud” and can be accessed at anytime via the user’s secured account. My steer axles on my tractor are spring suspension only - how do I monitor the steer weight? The AppWeigh app shows a calculated weight for the steer axles based on the data transmitting from the AppWeigh scale sensor you install on your drive axles. This calculation provides a very close steer weight for most applications. I have not installed my sensor yet, but my unit was set up on my phone previously. When I opened the app today (sensor next to me) it is not connecting. Do I have to re-pair or reinstall the app now? No. After the initial pairing, the sensor will go back into “sleep mode” until it is connected to pressure. If you would like to check that your sensor is still paired before installing it, you can wake it anytime by removing the sensor for 30 seconds, and reinserting it. It should then be visible by the app for the next two minutes before returning to sleep mode. Do you offer a weight solution for my spring suspension equipment? Unfortunately, not at this time. The AppWeigh scale sensor and app require air suspension to obtain the needed weight information. I have another scale system already mounted on my truck and/or trailer, but it isn't Bluetooth enabled. Can I add the AppWeigh scale sensor to my existing scale to read my weight on my smartphone/tablet? YES! You can add the AppWeigh scale sensor to any existing air suspension scale by simply tying into the same airline of that axle group already being monitored. This makes for a very quick and cost effective upgrade to any air suspension scale.